We create an emissions strategy for you that optimises your carbon assets and efficiency goals while increasing profitability and reducing risk through the accurate measurement and management of your company and product carbon footprints. A carbon footprint without a clearly defined emissions reduction strategy is merely a compliance document that lack’s real value. An emissions reduction strategy requires real engineering solutions that are viable and can be implemented in the short, medium and long term. We assess your organisation’s carbon footprint, set goals, budgets and timelines then embark on a reduction strategy. We assess the carbon footprint of specific products. We verify your organisational carbon footprint to ensure its accuracy using international standards. Terra Firma Solutions will manage the submission of your Carbon Disclosure Project documents. 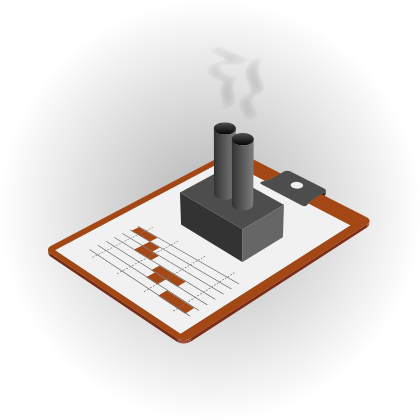 We help you identify carbon assets within your business and develop these to final registration and issue of the credits. An Emissions Reduction Strategy is an important part of any company’s drive to reduce costs while reducing its potential Carbon Tax Liability. You cannot manage what you don’t measure so an accurate carbon baseline is a critical first step but what then? Let our experienced team of engineers help you to put in place an emissions reduction strategy that identifies new revenue streams through carbon project development, uncovers emissions saving opportunities and reduces your risk.